Most of the animals that live in the Mojave Desert are harmless to humans, but there are a few creatures that are dangerous, even deadly, under certain circumstances. Predatory animals include everything from snakes and reptiles to mammals and insects. Most experts recommend giving these animals a wide berth when traveling through the desert. The Mohave Desert is home to several different snakes, but the most venomous is the Mohave rattlesnake. 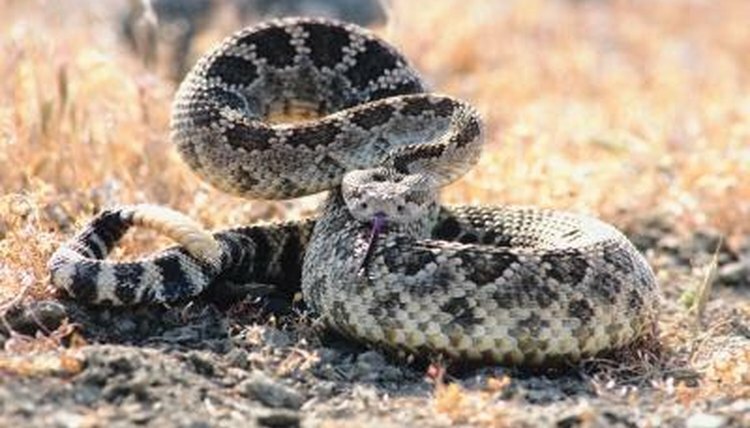 Also known as the Mohave diamond rattlesnake and the desert diamondback, the Mohave rattlesnake is a pit viper with potent venom that is deadly to humans. These snakes prefer high desert and lower mountain slopes, but can live in anything from dry desert to grasslands and bushes. Most rattlesnake bites occur when people intentionally bother a snake. The Gila monster has an intimidating name, and for good reason. Not only is it the largest lizard native to the United States, it is also venomous. Gila monsters are named in honor of the Arizona's Gila River basin, where they were first found. You can identify a Gila monster by its black body, which is marked with dramatic patterns of pink, orange or yellow. These reptiles spend nearly all their time in underground burrows and will usually not bite humans unless harassed. Although their bite is very painful, it is not deadly. Mountain lions are one of the larger animals in the Mojave Desert. They usually stick to mountainous regions, but have been known to roam in desert areas adjacent to high mountains. Mountain lions are solitary animals that are normally wary of humans. However, they have been known to stalk children. When mountain lions hunt, they attack from behind, biting at the prey's neck or the base of the skull. Also known as killer bees, Africanized honey bees only recently invaded parts of North America, including the Mojave Desert. These deadly bees are known for viciously attacking anything that unwittingly strays into their territory. However, they are most dangerous when you attempt to bother their hive. Although the venom of an Africanized honey bee is no more potent than the venom of a regular honey bee, killer bees earned their name because they attack in larger numbers and pursue their prey for further distances. They also stay agitated longer than the traditional honey bee when they have been disturbed.